White Lavender seems a little unusual, however a number of varieties are available and they do provide a different contrast to the garden. A little rider or disclaimer here, most white lavenders do have just a touch of pale lavender pink in the flowers as they age. New flowers are very white. Flowering in mid summer this is a white variety as the name suggests. 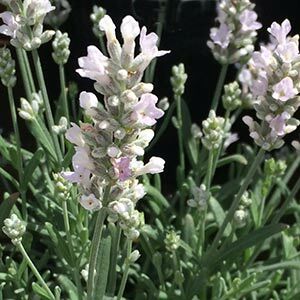 With snowy white flowers this variety of English Lavender is fragrant and the silvery grey foliage contrast well against the white flowers which rise above on terminal stems to 80cm in height. A number of named varieties are available including a few lower growing or ‘dwarf’ forms. You will see it offered simply as English white Lavender as well as number of other names. Like most species Lavandula angustifolia ‘Alba’ grows best in a well drained soil humus rich soil in a sunny position. The lower growing varieties Lavandula angustifolia Nana ‘Alba’ will reach around 40 cm in height. are excellent for planting next to paths as an informal border or hedge. White lavender also looks great when grown in containers. The same conditions are required as for other Lavenders. Mulch around plants in spring to maintain a cool root run. Fertilise with a slow release all purpose fertiliser in spring. Prune lightly after flowering to encourage a second flush of flowers. Prune back in spring as soon as new growth commences to maintain shape and size. Try not to prune back into old wood.